London is one of the top travel destinations in the world, but navigating this large city can be overwhelming for a first time visitor. Using an Oyster card, a credit card sized transport smartcard, is an easy way to save time and money if you are planning to use public transportation in London. An Oyster card can be used on just about every form of transport within London including public bus, tram, and rail services within the city. Our goal is help you decide if an Oyster card is a good fit for you and to help you effectively use your card on public transportation in London. First we’ll cover the main types of Oyster cards that are available, how to choose the best one, and how to buy an Oyster card. Then we’ll talk about where you can use them, how to use them for travel, how to recharge the cards, registering your card, and note important travel exclusions for visitors. Finally we’ll cover special issues such as how to get refunds, avoiding double payments, available discounts and concessions, the alternative option of using contactless cards, the use of pink readers, and tips for those traveling with children. What is the London Oyster Card? Why You Should Buy An Oyster Card in London? An Oyster card is a credit card sized card that can be used to electronically pay for travel on London transport. All you have to do is load the card with credit, and then you can use it for nearly all your public transport needs around London without having to buy individual tickets. The best reason to get an Oyster card is cost savings and convenience! It is significantly cheaper to travel in London using an Oyster card than it is to purchase individual tickets for each trip. The only reason you would want to just buy individual tickets is if you are only using public transportation once or twice during your stay. However, the average visitor will use public transportation multiple times each day and the Oyster card can save both time and money. As an example, traveling from Zone 1 to Zone 2 on the Tube will cost you (as of September 2018) £2.40 using an Oyster card versus £4.90 if you buy a single ticket. So you’d pay more than twice as much if you bought individual tickets versus using the Oyster card! An Oyster Card will also save you money compared to using a Bus & Tram Pass to ride the buses and trams, which don’t accept individual tickets or cash any longer. Oyster cards also have a capping system, which can save you even more money. There is a maximum amount that you can be charged on a daily basis (days run from 4.30am to 4.29am the next day) for traveling in different zones. After you exceed that amount in one day, your travel is free for the rest of the day. Capping varies based on the zones you travel in, but for example, for peak travel in Zones 1 & 2, the maximum daily fee is £6.80 (as of September 2018). So no matter how many times you travel on public transport using your Oyster card in London’s zones 1 and 2, you will never be charged more than £6.80 a day. An additional cost saving benefit for families is that children under the age of 11 (up to four), can travel for free on London’s public transport if in the company of an adult holding a valid Oyster card. In terms of practicality, it’s a lot more convenient to use an Oyster card when traveling in London. They’re accepted on nearly all forms of London’s public transport network, and you just swipe them on the Oyster reader to validate your transport. You don’t have to keep fiddling with loose change or buy individual tickets – an option that isn’t always available anyway. For example, on London buses there are no facilities to buy tickets onboard or at most bus stops. If you’re interested in learning about all the different types of transport options available, check out Laurence’s post which gives an overview of all the major London transport options. There are a lot of ways to get you around London! There are two main types of Oyster card: the standard Oyster card and the Visitor Oyster card. We’ll talk about each and their primary differences to help you decide which is the best fit for you. The standard Oyster card is a credit card sized piece of blue plastic. 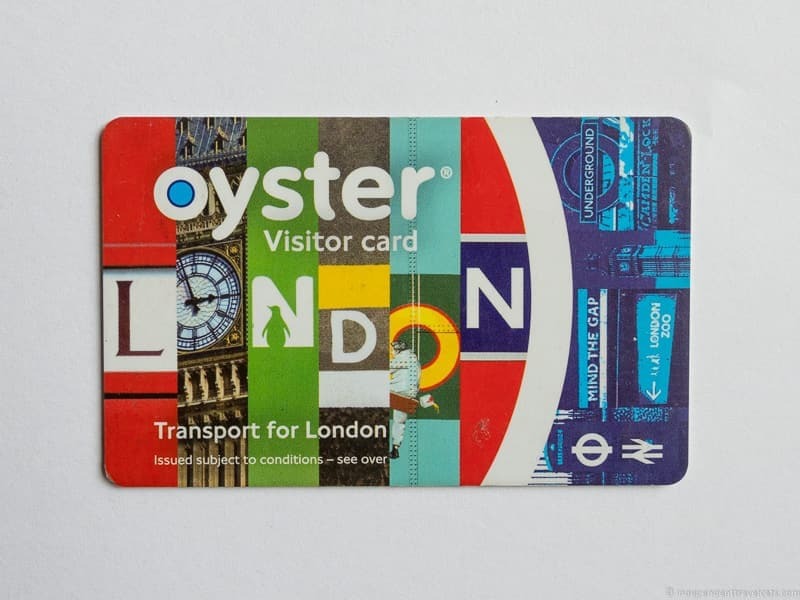 The Visitor Oyster card is the same format, but is more elaborately visual, with an artistic design. Other than external appearance, the standard and Visitor Oyster cards offer the same functionality in terms of transport options and are used in the same way. They can both be recharged (topped up) and are designed to be a transport card that you can keep and use for a prolonged period of time. Both cards also allow you to obtain a refund for any unused balance (see more on obtaining refunds later in the post). The main differences are the fee for obtaining the card, ability to use travelcards with the card, offers attached to the cards, and where you can buy them. Fees. First, in terms of fees, the blue standard Oyster card has a refundable £5 deposit that you can have refunded when you are done with it. The Visitor Oyster card has a non-refundable £5 activation fee. NOTE: The Visitor Oyster card activation fee changed from £3 to £5 beginning September 17, 2017. Travelcards. The standard Oyster card allows visitors to add travelcards and bus and tram passes onto the card and the Visitor Oyster card does not. 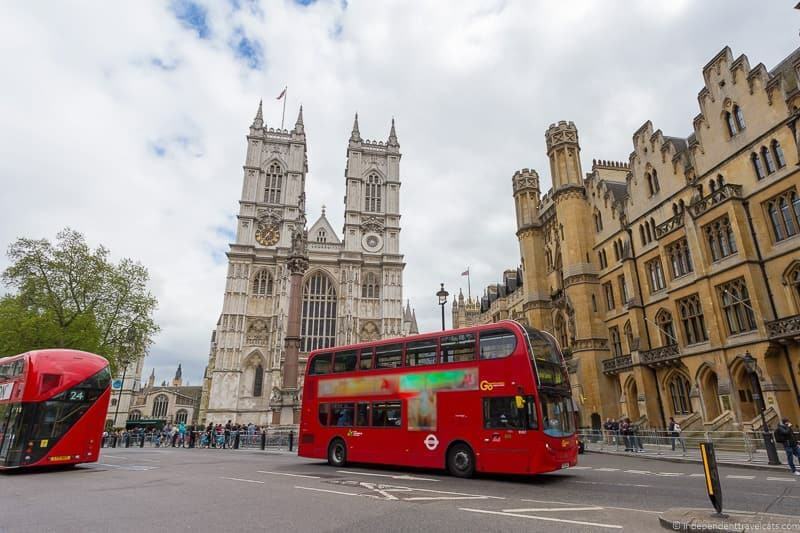 This is unlikely to matter for those staying for only a short time in London, but if you are staying a week or more in London, you may want to consider loading a 7-day London Travelcard onto a standard Oyster card. These are useful if you are visiting London for a week or more and are planning on doing a lot of travel, as these allow you to travel for an unlimited number of journeys within certain zones for a fixed price. For example, a 7 day zone 1 & 2 travelcard will cost you £34.10 at current prices (prices as of September 2018). If you consider that the fare cap price for daily use in these zones is £6.80, then a week of travel hitting that cap every day would cost you £47.60. In that scenario, a travelcard could save you £13.50. Note you you can purchase travelcards without having an Oyster Card if you purchase them in advance. So if you are staying for 7 days or more you might consider them as it will avoid the Oyster Card deposit or fee. The Bus and Tram passes can be a good choice for those ONLY using bus and/or tram travel in London. But you’ll probably still save money using an Oyster Card. The Visitor Oyster card does not support travelcards, presumably because most visitors are in London for a shorter period of time, and the added complexity of choice that the travelcard system adds outweighs the potential benefits for most visitors. Discounts and offers. The Visitor Oyster card is designed for travelers to London and the card can be used to obtain a number of discounts throughout the city on food, shopping, attractions, theatre tickets, and other London experiences. You can see a list of Visitor Oyster Card current discounts at the bottom of this page. The standard Oyster card does not have these perks or discounts. The decision over the Visitor Oyster card versus the standard Oyster card comes down to the difference in fees, whether or not you want to add a travelcard, if you plan to take advantage of the discounts associated with the Visitor Oyster card, and convenience of purchase (discussed in the next section). Both these cards give you full access to the majority of London’s public transport network, including the London Underground (Tube), city buses, Docklands Light Railway, and many overground trains, including the Gatwick Express train from Gatwick Airport. You have a number of options for purchasing an Oyster card for your trip to London, including online, in person, and as part of the London Pass. The ways to purchase the standard Oyster card and the Visitor Oyster card differ and are noted below. Visitors wanting to obtain a pass before they arrive in London should plan ahead and consider buying the Visitor Oyster card online before their trip. The standard Oyster card can be purchased online, but can ONLY be shipped to a UK address (free shipping). The Visitor Oyster card can be purchased online before you visit London and is available for shipping worldwide. If you are thinking about going to a lot of attractions and museums in London, you may also want to consider the London Pass option below as well. You can purchase a standard Oyster card on arrival into London. 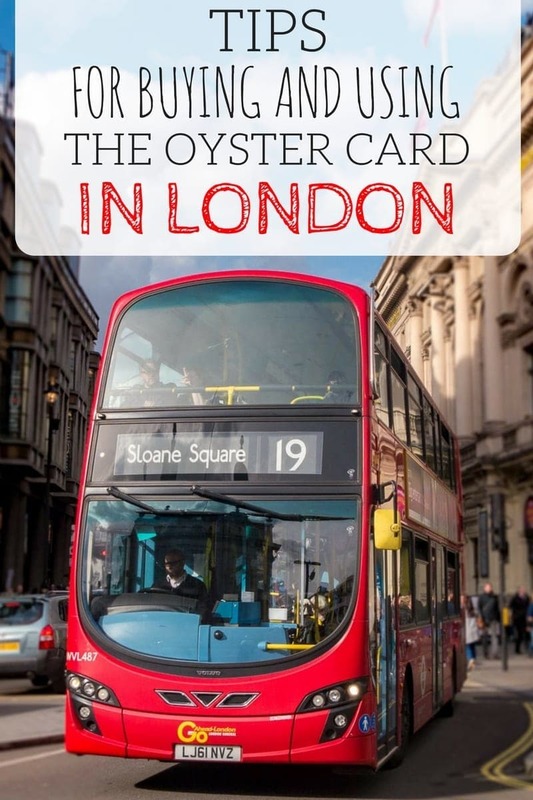 You can buy the standard Oyster card from places throughout London, including at most major tourist arrival points such as London’s Heathrow Airport and Gatwick Airport. They are for sale from Underground ticket machines, Oyster ticket stops (a series of businesses around London, see Oyster map here for nearest location), London Overground ticket offices, train station ticket offices, and London Transport Visitor Centres. Visitor Oyster cards can also be purchased in person, but not once you are actually in London (except if you purchase them with a London Pass, see below). You can buy them from overseas travel agencies and some UK visitors’ centers. They are also available onboard Eurostar trains traveling to London and at Gatwick & Stansted airport. You can also purchase the Oyster card as part of a London Pass purchase, killing two birds with one stone. A London Pass is a fantastic way to save money on London attractions (read our full London Pass review here), giving you free access to over sixty of London’s top attractions, as well as some skip the line privileges. When you buy a London Pass, you have the option to add a Visitor Oyster card, which comes preloaded with a set amount of credit depending on the length of London Pass you choose. You can then reload it with credit as needed. London passes with a Visitor Oyster card can be purchased online or in person in London. You can only buy them in person at the London Pass Redemption Centre Desk located at 11a Charing Cross Road London, WC2H 0EP. We’ll cover where you can use your Oyster card, how to use it at the stations, how to add credit to your card, and even how to get a credit refund. These are the same for both the standard Oyster card and the Visitor Oyster card. An Oyster card covers the majority of public transport options in London, including buses, trams, Underground Tube, Docklands Light Railway (DLR), TfL Rail services and London Overground services in Zones 1-9, all suburban national rail services in zones 1-9, Thames Clipper River Bus services, and the Emirates Air Line cablecar service. This essentially means that almost all tourist attractions and hotels can be easily reached via public transportation with the Oyster card and you can get to all the major rail stations within the city if you are planning a rail journey to another part of the country or to an international destination. You can currently use the Oyster card to travel to and from Heathrow Airport, Gatwick Airport and London City Airport. The Oyster Card is not currently valid for Stansted Express or services to London Luton airport, Stanstead airport, or London Southend airport. You can use an Oyster card to travel via Underground from all Heathrow Terminals, which is the most cost effective way of getting from Heathrow Airport into London. You can use your Oyster Card to use train services from Gatwick to central London. You can also use your Oyster card to get to and from London City Airport, via the Docklands Light Railway (DLR). You can also use the Oyster card for some additional express train services, which include Gatwick Express at Gatwick Airport and Heathrow Express at Heathrow Airport. Note that these services are much more expensive than the other train services so you will want to make sure you have enough Oyster Card credit or use your card for an alternative method of transport. For much more information and tips on airport travel, check out this guide to getting from London airports to London. As mentioned above, the Oyster card does not cover travel to all of London’s aiports. Oyster cards are not accepted on East Midlands Trains, Grand Central, Hull Trains, Virgin Trains, or Virgin Trains East Coast services. Eessentially, you cannot use your Oyster Card for rail or bus services where the journey starts or finishes outside of London, with a few specific exemptions. If in doubt about whether a trip is covered, ask a badged member of staff at a station. There are a some popular tourist destinations inside and near London that you might want to visit, and wonder if you can use your Oyster card to visit, such as Hampton Court Palace, the Warner Bros. Studio Tour – The Making of Harry Potter, and Windsor Castle. For Hampton Court Palace, you can use your Oyster card to travel to it, as it is in Zone 6 and can be reached by train or bus. For the Harry Potter studio tour, you can use your Oyster Card to travel via National Rail train to the Watford Junction station and then you can take the studio tour shuttle (small fee) to the film studios in Leavesden (must have a studio ticket purchased in advance). Or you can just book a tour that includes your ticket and direct transfers from London. 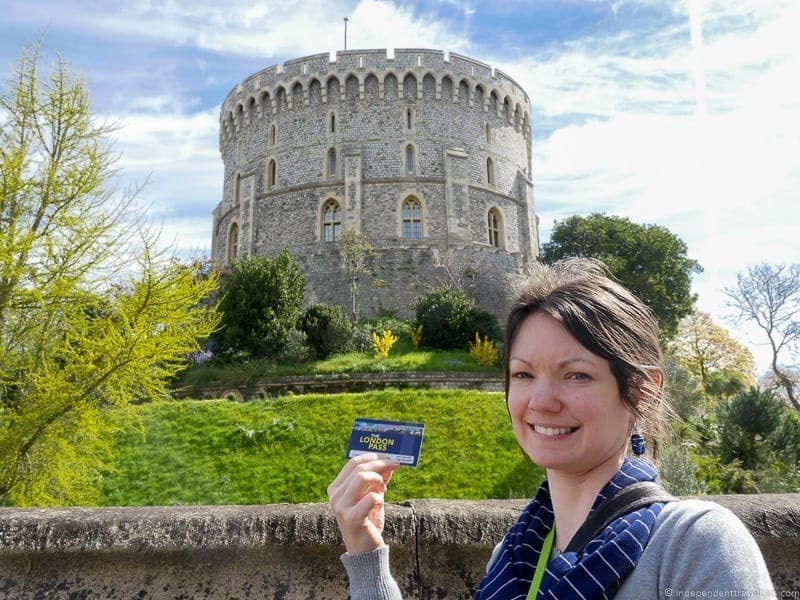 For Windsor Castle, you cannot use your Oyster card, as Windsor Castle is outside London. However, as a tip for those who have a London Pass, you can use your London Pass to travel to Windsor Castle from Paddington Station for free. Read more about how to do that in our full review of the pros and cons of the London pass. Using an Oyster card is very easy and it is the same whether you have a standard Oyster Card or a Visitor Oyster Card. All the forms of transport that accept an Oyster card have a large circular yellow reader that you just have to touch your card onto. For access to tube stations, this card reader controls the turnstiles or gates. For most journeys in London, including London Underground Tube, Docklands Light Railway (DLR), rail journeys, and Thames Clippers boats, you have to touch a yellow reader both when entering and exiting the station/dock. In most cases it is hard not to tag the card as you exit, because the majority of these stations have a gate to exit that is activated to open with your Oyster card. However, not all do, so it is important to remember to tag off. The reason this is important is because fares vary based on distance, so if you don’t touch out, the system will assume you have gone the maximum distance, and may charge you a much higher fare than you need to pay. When you touch the Oyster reader, it will show either a green light or a red light. A green light indicates that you have sufficient credit for your journey. At gated stations, this will open the gate or allow you to proceed through the turnstile. If the light is red, this indicates that you do not have enough credit, and you need to purchase more credit before you can continue your journey. If you have enough credit and think there is something wrong with your card, find a staff member to assist you. For bus and tram journeys which are fixed price, you only need to touch the Oyster reader at the start of your journey when you board. Do NOT touch out when you get off a bus or tram, or you will be issued with an additional fare. 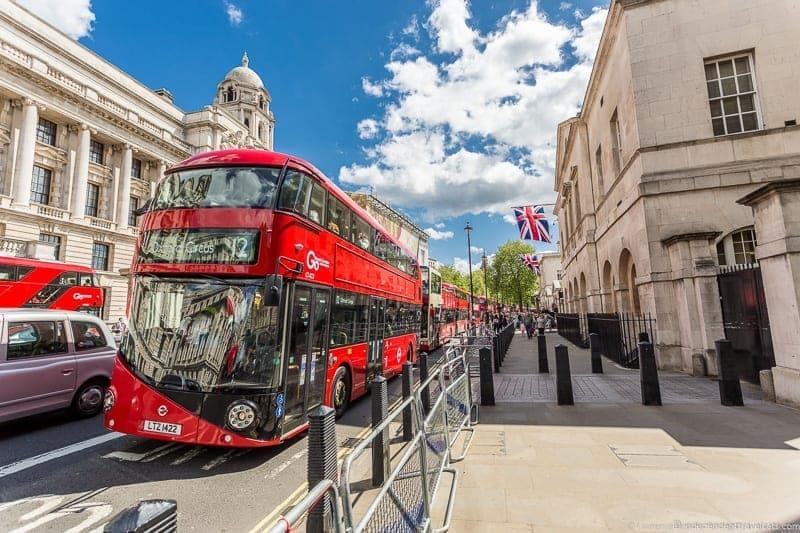 For more information on each form of public transportation, check out Laurence’s post that covers the basics of all forms of London public transit. There are a number of options for topping up (aka recharging or reloading) your Oyster Card, or adding more travel credit. The easiest way is at London Underground Tube, London Overground or TfL Rail stations, where you can use ticket machines to top up your card. Simply touch your card to the yellow reader at one of these machines and follow onscreen instructions. Don’t forget to touch your card to the reader at the end of the process to check to ensure the top up is correctly applied. You can also add credit in person at a ticket desk in a station or Visitor Centre or at a Oyster Ticket Stop within the city. Finally, if you have a UK address, you can register your card online, and top it up online using a credit or debit card. If you purchase a standard Oyster card, you can add travelcards to your Oyster card if you would like to pre-pay for your travels. The most common reason a visitor would use this option is to add a 7 Day Travelcard. These can be added at ticket machines at Tube, DLR, London Overground, TfL Rail and National Rail stations or ticket offices at London Overground, TfL Rail and National Rail stations, London visitor centres. If you reside within the UK and have registered your standard Oyster card, you can also add travelcards online. When you leave London, you have the option to get a refund for your Oyster Card for any unused credit that is left on the card. You can also keep the card for a future visit as the credit never expires. If you had a Visitor Oyster card and may return to London, this might be a better option at the activation fee of £5 is non-refundable, so that money is lost. For a standard Oyster card, the £5 deposit is refundable, so you can get this money back if you wish. If there is less than £10 credit on your Oyster card, you can get this refunded at any Underground Tube station Oyster machine. Just follow the on-screen instructions. Note that 48 hours needs to have elapsed from the time you first used the Oyster card in order for you to be able to get your refund. If you get a refund from an Oyster card machine at a station, your card will also be canceled, meaning you will lose the £5 activation fee if you have a Visitor Oyster card. If you think you may be back to London, a better option to obtain refunds for those with either type of Oyster card is to go to a TfL visitor center. Here they will be able to refund the credit on your card, but they will return the card to you in working order, meaning you will be able to use it again. This way you will not need to pay an activation fee on your next visit. Finally, you can apply for a refund by post, by sending a letter to TfL Customer Services, 14 Pier Walk, 4th Floor, London SE10 0ES, United Kingdom. Refunds are issued in the form of a GBP cheque, which may be problematic to cash for visitors who are not from the UK. I’d suggest avoiding this option if possible, and getting a refund in person at a visitor center if you can. You can read all about the various options for getting a refund on your visitor Oyster card here, and standard Oyster cards here. Note that if you have unused credit on an Oyster card, another option is you can give the card with unused credit to a family member or friend who plans to visit London. This is a particularly good idea for those who do not plan to return to London and forgot to get the credit refunded before they left the city. Standard Oyster cards can be registered, but only if you register it with a UK address. If you have a UK address (or if you have friends or family with a UK address), it is recommended that you register your card so that you are better protected in case of theft or loss. Unregistered cards will not be eligible for refunds in the case of a card being lost or stolen. Those with registered accounts can also use their accounts to track their travel, check their card balance, top off their card, and purchase travelcards online. Visitor Oyster cards can NOT be registered and protected. Visitors should therefore be protective of their cards and treat them like cash. For help with an issue, I would check the website for help first or ask a staff member at a London transport station or ticketing office. If that doesn’t work and you still need assistance, you can call the Transport for London hotline at +44 343 222 1234 (8am to 8pm GMT) and choose the Oyster card option. Note that fees may apply for the call. Here are some more things to know about Oyster Cards! Most of this won’t apply to you as a visitor, but some of the information may be important, especially for those traveling with children. In recent years the Oyster card system has been upgraded to support new “contactless” card technology. This allows users who have a contactless payment card to use this to pay for their journey, rather than buying a ticket or Oyster card. You can read about the different types of payment option for London’s transport and how Cash vs. Oyster Cards vs. Contactless Cards compare in this article we wrote. Contactless cards can be a particularly good option for those who already have a credit card or debit card with contactless technology that does not incur international transaction fees when used in the UK. Since some people have both Oyster cards and contactless enabled payment cards in their wallets or billfolds, there is a possibility that multiple cards could be scanned at once. The main thing to be aware of is that if you keep your Oyster card in your wallet or billfold, and don’t take it out to scan it, if your wallet also contains a contactless debit or credit card then the Oyster reader will not know which card to charge, which may result in you being charged more than once for your journey. To avoid this happening, we recommend taking out the card you intend to use and only scanning that. Read more about avoiding card clash here. In London there are often multiple routes that you can take between two locations, some of which are cheaper than others. For example, when traveling across London, it can be cheaper to avoid Zone 1. In order for the system to know which route you are taking, there are a small number of pink card readers that you can touch your Oyster card at certain Overground and Underground stations. These inform the system of your route, to help ensure you pay the right fare. Note that pink card readers do not validate your journey nor do they charge you, so you still need to be sure to use the yellow card readers at the beginning and end of your journey. We have rarely used (or even saw) these and it is likely that most visitors will not be using these but we wanted to point this out for those who really want to save money. For more information on pink card readers and locations you can find them, see the official website here. There are a number of discounts and concessions available for people who meet certain requirements or are part of a certain demographic; however most of these discounts are only possible for London or UK residents. There are potential discounts for students, seniors, children, those seeking jobs, disabled travelers, and veterans. Most of these require applying for and obtaining a special photocard to receive free or discounted travel in London. If you think you may be eligible, you can check out the various London transport discounts and concessions online BEFORE deciding to purchase a Oyster card. Visitors traveling with children should check out the next section. Oyster cards can be a great value for families traveling with children, and many public transit services are free for younger children. Families with children age 11 or older should be sure to examine discount options prior to their trip. Find out more details here. If you are traveling with children, they are eligible for discounted travel on London transport. It just depends on their age. For those age 11 or older, you will need to apply for a Zip Oyster photocard for them to receive the discounted travel. Children under age 11 can travel for free with a parent or guardian holding a valid Oyster card on Tube, DLR, London Overground and TfL Rail services. You will need to see a member of staff at stations with barriers in order to get them in and out of the station on your card. If your child looks older, it is recommended that they get a Zip Oyster photocard to prove their age. Children aged 11 – 15 can apply for a Zip Oyster photocard. This entitles them to free travel on all buses and trams in London, and half price fares on other TfL services in London. Apply here. Children aged 16 -17 can also apply for a Zip Oyster photocard, which entitles them to half-rate travel on all TfL services. A Zip Oyster photocard can only be applied for online. If you live in the UK, it takes a week to process. Applications from outside the UK must apply at least four weeks in advance. Full details and the application process can be found here. 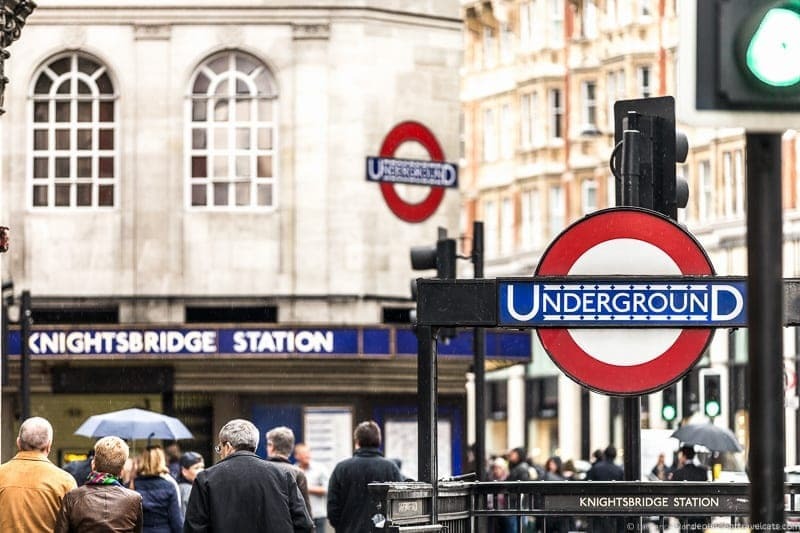 London transport prices and policies are always changing, so be sure to check for the most updated prices and policies regarding public transportation fees and Oyster cards online at the Transport for London website before your trip to London! So there you have our information and tips on buying and using an Oyster card in London! It may sound a bit complicated but once you have one, Oyster cards are easy to use and to recharge. If you’re visiting London, you can plan in advance and purchase your Visitor Oyster card or London Pass online now! Have you been to London? What was your experience using public transportation in London? Did you use an Oyster card? As always feel free to ask us any questions you may have about using an Oyster card or just any questions about travel in London. London Pass Review & Tips: Is the London Pass Worth It? Hello! Great blog, love all the info you provide. I have a questions for you concerning the contactless card and travellling with a 10 y.o. Can he still travel for free, even though me and hubby will both be using the contactless bank card instead of an Oyster card? Thank you very much, Jessica! Yes, that helps a lot!!!! Hi Katja, A good option might be for you and your husband (or one of you) to use Visitor Oyster Cards instead of using your credit cards, and then he would get free travel without needing to buy a card. Or you can purchase him a Visitor Oyster Card in advance and then you can have the Young Visitor discount applied to the card once you arrive. The discount can be applied by tfL staff in person at most Tube stations, the 8 Visitor Centres, Victoria National, and Rail station ticket office. But the Visitor Card has to be purchased before you arrive in London to get this discount. But you would probably save more money just having him travel for free with an Oyster Card you are using. There is no specific Young Visitor Discount Oyster Card, you will need to purchase a Visitor Oyster Card before your trip to London and then have the discount applied once you arrive. The discount is available for children age 11 to 15, so it will work for your 12 and 14 year old. The Young Visitor discount gives your child half adult rate pay as you go discount for up to 14 days. You don’t need to bring photos, but you may be asked for an ID to prove the child’s age, particularly if they look older. So I’d just have their passports on hand when you have the discounts applied to their cards. Great article! A couple of questions: Does the Zip Oyster Photo Card cover travel on the Tube or only buses and trams? Can London travel cards be added to Zip Oyster Photo Csrds? And we are able to order those all before our trip? Hi Teresa, It depends a lot on the age of the child as they are more important for older children in terms of benefits than younger children. So children under age 11 get free travel on London buses and trams already without a card (and on the Tube when accompanied by a paying adult), so the Zip Oyster photocards are primarily for additional discounts and when a child under age 11 may need to travel on their own. But for those age 11 to 15 they allow for free travel on buses and trams plus child rate fares on Tube, DLR, London Overground, TfL Rail and Emirates Air Line. There is also a 16+ one that provides discounts. So I would be sure to read the Tfl guidelines carefully for whichever of the cards you are interested in applying for. Yes, you do need to apply for them in advance. If you live outside the UK, you’ll want to apply at least 4 weeks in advance of your trip as the cards take awhile to process. Thank you! My daughters are 14 and 16, so they would qualify. I went to read the guidelines, and it states that they travel at half fare on the tube. It looks as though it’s not preloaded on zip cards, and is something we need to do once we arrive in London. Am I reading this correctly? My main goal is to have as much done in advance to maximize our vacation time. Can the travel card for attractions be added? I appreciate your help! So yes, for your 14 year old daughter, the Zip Cards would give her free travel on buses and trams, child rate fares on Tube, DLR, London Overground, and on TfL Rail and Emirates Air Line, and 50% off most fares on National Rail services. There are fewer benefits with the 16+ card. The Zip cards do need to be applied for in advance, it is easy to do in advance but you need to have their information and photos ready. Note that there is currently a £15 administration fee to apply for a card. So I would weigh the cost benefits for these. If you are going to be in London for a month these will likely save you money but unlikely to save you much if only going to London for a few days. The photocards do not include credit when you purchase them (at least not to my knowledge) but you can add travel credit to them and certain travelcards once you have them online or in person once in London. The card does not need credit for free travel (e.g., bus and tram travel for a 14 year old with card), you just need to tap in and out with them. I believe you can add travel credit to the cards via your online account you create to get the photocard. These photocards only are for Tfl travel and are not relevant for attraction entry. For attraction passes, you will want to get something like the London Pass. You can purchase that with Travel for children but it does not come with the Zip photocard option. Definitely needed this information now. Thank you for posting all this detailed info for my vacation to London! Thank you for the wonderful article. I’ve been to London twice. Both times I’d bought a london pass and travelcard before arriving. I wanted to ask if the oyster card that I got with the London Pass expires. Excelent article! However, I still have a few doubts. Suppose I arrive at Heathrow and depart from Gatwick 9 hours later on the same day. So, I buy a standard Oyster at Heathrow, take the tube to downtown, see London’s main attractions and head to Victoria Station. Once there, I touch the yellow circle at the gate in order to access the train leaving for Gatwick. Once I am on the other side of the gate, will I be able to access the “TfL Visitor Centre” ? Or is it on the other side of the gate? In other words, how do people ask for a refund if they need their cards to pay for the last ticket? I know that it will have been 9 hours from my first usage, but does the 48 hour limitation apply to ticket machines only, or will I still be able to ask for a refund in person? You can actually get a refund for the Oyster Card at Gatwick Airport, so once you are already at the airport. “At Gatwick Airport you can only get a refund for any unused pay as you go credit and the Oyster card deposit up to a combined value of £15. To do this, go to the rail ticket desk in the Onward Travel area in the South Terminal. This is the only place at Gatwick Airport where you can get a refund if you return your Oyster card.” I am not sure of the hours of this desk so you may want to call and check if you are planning to visit late in the evening or early in the morning. Yes, I believe that the 48 hours limit only applies to the machines, so I don’t think the machines will be able to refund you. I believe the Visitor Centres can refund at any time and will return the balance to your debit card or pay in cash. There is also the option to mail by post your card with its remaining balance to Tfl from outside London and they will refund you by a mailed cheque in GBP (probably not a good option for you!). Thank you Jessica! It’s good to know that there’s a ticket desk at Gatwick where I can ask for a refund, and also that they can return the balance to my credit card, where it will be automatically converted to pesos or dollars (because I won’t be able to use pounds in Italy, where I’ll be heading next). Thanks a lot! Unbelievable Information on the Oyster Card in London. Thank you for this excellent guide! Hi there, you mentioned that “They are also available onboard Eurostar trains traveling to London and at Gatwick & Stansted airport.” Where can I confirm on this? I am travelling to Paris from London (2-ways) on Eurostar and would like to buy a Visitor Oyster Card on the train. That would be the most convenient and cost efficient for me. Thanks! Hi Julie, As far as I know you can still purchase a Visitor Oyster Card on Eurostar trains traveling to London. However, things do change from time to time, and it is a good idea to confirm if you want to buy them aboard the train. To confirm, I’d contact EuroStar by phone or email with this question (can see their contact details here) or send them a message via their social media pages to be sure they will be available aboard your particular route. If you find out they are not, please do let us know and we will edit our information for future readers. If for any reason they are not, we’d recommend purchasing the Visitor Oyster Card online before your trip. Hi Jessica, I called Eurostar and the agent initially said the Oyster Card is not available on their trains. After I told him that this information is published online, he double checked and said it is sold. He said it is a Visitor Oyster Card for 5 pounds with no credits though? Like what you wrote, I thought Visitor Oyster Card can only be bought outside of London OR together with London Pass only. Another thing I read online was if you want the free transport to/from WIndsor Castle, you need to purchase the London Pass TOGETHER with the oyster card (not London Pass alone), not sure how true this is? Have you any idea on this? 1. Yes, as we note, it would be the Visitor Oyster Card that is sold aboard the EuroStar as you will be outside of London, which is why they can sell it. You won’t be able to purchase it after you arrive in London (except for as part of the London Pass + Travel package in person). If you purchase the Visitor Oyster Card aboard the EuroStar, you will have to then add whatever credit you want to it to use it. 2. No, that information is incorrect about Windsor. You just need a valid London Pass and to follow the instructions as outlined in the London Pass guidebook and website to use the FREE transport to Windsor Castle. You can use an Oyster Card, but it will charge you. 3. Yes, Gatwick is located outside of London and sells the Visitor Oyster Card as noted in our article. Or you can purchase a single train ticket or the standard Oyster Card from an automated machine at the transport station there. Sounds like the concierge hours are different than those listed online, so getting a card there may not be an option given your travel times. Given your situation, I would have recommended purchasing the London Pass + Travel before your trip and having it delivered to your home before you trip. But since you didn’t do that, I would recommend purchasing the London Pass online (to save money) and picking it up for free once you get to central London. For the Oyster Card, you can get the Oyster Card with the London Pass + Travel option or pick up an Oyster Card while you are at Gatwick. There are few differences between the two cards, unless you want to use the discounts that come with the Visitor Oyster Card. Enjoy your time in London and Paris! just read your article, but I’m still not sure how to do best. this sunday I’m heading from heathrow to wembley stadium and afterwards from wembley stadium to gatwick. just these two rides. is there a better/easier solution than arrange and using oyster card for this purpose? An Oyster Card or contactless card is probably the best option as they will save you a small amount on the ticket prices (although it depends on the time of travel), but you can also just buy individual tickets. So you have three main options for public transit. 1) Oyster Card (Visitor cards must be purchased in advance, regular ones can be purchased on arrival); 2) If you have a contactless credit card or debit card you should be able to use it to pay for your travel. Many cards issued from the UK and Western Europe work, some other international cards work as well. They work similar to an Oyster Card, and you can find out more here; or 3) You can purchase 2 individual tickets to each destination. You can purchase tickets directly from machines at the station and many of the larger stations also have staffed desks where you can purchase them from an agent. If you decide to purchase an Oyster Card, you can get a refund for any extra money at Gatwick Airport before you leave if you wish, or save it for your next visit to London. Hope that helps and enjoy your time at Wembley! We’re planing a trip to London in November (2 adults) . It should be around 2-3 days for London sightseeing. I’ve read your recommendations on the 3-day London sightseeing as well as the London Pass explanation article. 1. Can you please (re)explain the capping logic? After 6.80 pounds transactions I can still move around for free? 2. Is the same applicable for other zones, likes Zone 6? 3. How much money would I need on an Oyster card for a 2-3 day London trips considering this 6.80 cap? So happy you found this helpful! 1. So basically if you are using an Oyster Card (or contactless card) the card will stop charging you for traveling within Zones 1 and 2, which at the moment is £6.80. Now, if you are also traveling within other zones, then the point in which it will cap is higher. You can learn more about capping here. 2. There is capping for all zones, but it is a higher rate as you include more zones. Most of London’s most popular attractions are within Zones 1 & 2. See link above for the capping rate details for the different zones. 3. £20 person should be fine if you are staying in Zones 1 & 2 for 3 days. If you are using it to get to and from an airport, you should check that fare on the Tfl website and add it as well. But you can always add money, and most Underground stations have machines where you can do this. Just a reminder that if you are visiting Windsor Castle and have a London Pass, you can get free travel there and back to central London without using you Oyster Card. You just have to follow the rules outlined in the guidebook and website. Wishing you a wonderful upcoming trip to London! Thanks for the reply and taking the time to answer all questions very thoroughly. I’ve got a better picture of the whole transport logic based on your article and your comments. Wishing you all the best and a big HI from Romania. Hello and thank you in advance. I am planning to visit London from October 4 to 7. I will be staying in zone 1 and will visit only areas in zone 1 and 2 but need to go back to Heathrow airport. Which is the best card to buy and how much does it cost? Either the regular Oyster Card or Visitor Oyster Card would work for your trip. You can purchase the standard Oyster Card at the airport, or you can purchase the Visitor Oyster Card in advance (or as part of the London Pass). The cost will depend on how many trips you take and the time of day. But it will be a maximum of £6.80 a day on your Oyster Card (but it depends how much you travel within the Zones each day) and it will be between £3-£5 per trip to the airport if you use the Underground (the cost depends on the time of day). So you might start with an Oyster Card with a credit of £25 or £30 and then add any additional credit if needed later on your trip. Last time I was in London, most of the tube stations were not equipped to top off Oyster cards with cash. I want to use cash, as my US bank will charge me foreign transactions fees (a fixed fee + a percentage of the total) if I use my credit or debit card. I have been trying to locate a map/directory of Oyster ticket stops where I can use cash and an actual human to top off my card. TfL claims to have such a map, but I can’t get it to work. I’ve tried using various London addresses, yet no ticket stops are identified on the map. I can’t use their geolocation feature, as I’m not currently in London. I just want to enter a London address and find the nearest ticket stops. The process shouldn’t be this frustrating and difficult. Hi Shahmeran, Sorry you are having such a difficult time finding this information. I don’t know of a map that states which stations allow you to pay/top up by cash but most of the largest stations will have machines that accept cash. Also most of the larger station have manned ticket counters. If you need more specific information, I’d contact tfl, you can call them or send them a message via Twitter or Facebook. Hope that helps and wishing you a great journey to London! I just have one question I am not sure about. I’m arranging to buy a London Pass and Visitor Oyster card for my friends to collect from my home. They will first go to Hampton Court Palace (from Waterloo), and return to Waterloo after visiting HCP. Then they’ll do tours of London. Will they have to top up the Oyster card for the return leg from Waterloo to HCP? If they are purchasing the London Pass + Travel together, then the Visitor Oyster Card will come with some preloaded credit. The amount depends on how many days the pass is valid, and you can check that amount here. So for their trip to Hampton Court Palace, that will use a certain amount of credit (currently either £5.50 off-peak or £8.00 peak times) from their Oyster Card. But they should still have credit to keep using it to explore more of London after returning to Waterloo. But if they run out during their trip, they will need to top if off and can add credit at any time. If you are worried about your friends not knowing how to do it, I would just tell (or show) them how to check the balance of their cards and top it off if needed at a station so they know how to do it. It works the same as any other Oyster Card. Yes, I would recommend the 1 day London Pass if you are planning to visit The Shard, do the HOHO bus, and Thames river cruise all on the same day. It will also give you the opportunity to visit or revisit a lot of the other attractions in the area if you wish. The London Pass covers over 60 attractions so it is likely there are many you have not visited yet or may want to see again. Yes you can use the Oyster Card to travel from Heathrow to Earls Court (or anywhere else within London) via the Underground (“the Tube”). You can purchase the London Pass + Travel option that will include both the London Pass plus the Visitor Oyster Card. Your other option is to purchase just the London Pass and purchase the Oyster Card at the airpot or once in London. In your case if you want to use your Oyster Card from the airport, I would recommend ordering the London Pass + Travel online and having it delivered to your home before your trip so you can start using it as soon as you arrive at the airport. You can top up any Oyster Card as you travel around. You can top up a card at most Underground and Overground machines or if you need help, you can ask an attendant. If you are traveling to Edinburgh, you might want to check out our London to Edinburgh travel guide. We have 24 hours in London ( stopover ) and we plan to visit London city. 1) Can we get the refund of deposit and balance if we purchase the normal London Oyster card for less than 24 hours.? How much will be the daily CAP if we first travel from Heathrow airport to the city and then later move around London zone 1 & 2? What will be the total charges? How much amount do you suggest to top up in the Oyster card? 1.) Yes, you should be able to apply to get a refund on the deposit and any remaining balance on your Oyster Card. 2.) The fare would be £3.10 per person from Heathrow (outside of 6am to 9am where you pay £5.10 since it is peak travel time in London) and then it will be capped for all the Zone 1 & 2 journeys and the cap is currently at £6.80. You’ll need to also pay the same fare (£3.10 or £5.10) to return to the airport. So you should be OK with putting £15 on your card (or £4 more if you are traveling at peak times to or from airport). But you may want to put a pound or two extra just to be sure. 3.) Note that the fares are capped within a midnight to midnight GMT period so the above assumes you are traveling all within 1 calendar day. If you are traveling on 2 separate days (e.g., spending the night in London and then returning to the airport the next day), you’ll need to calculate for each day. You have provided us a very useful and details information about the Oyster card. It will help us a lot during our visit to London in October. Hello! This is such an amazing article! 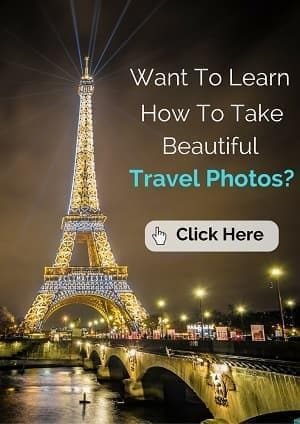 We are planning our very first trip to Europe and I have another question for you. We will be landing at Heathrow then headed directly to Kings Cross for a train to Edinburgh for a couple of days. We will then head back to London where we will spend about 6 days with one day headed to Portsmouth. We are thinking of getting the London Pass for our time in London but do you have any advice on how to arrange transportation to Portsmouth? We’d like to see the war ships and stone henge. I appreciate any help you can give us. 1. If you are looking for any tips for what to do in Edinburgh we live nearby and have a ton of content such as this top Edinburgh attractions post and this post about lesser known attractions in Edinburgh. 2. The London Pass is great for saving on sightseeing, and you can see our London Pass review here. If you enjoy warships, be sure to check out HMS Belfast (free with London Pass) and you might enjoy this list of military related sites in London. 3. To Portsmouth, you have a few options (train, bus, rental car, join a guided tour), but I would probably recommend taking a morning train from London. It is about a 2 hour train and the nearest train station to the historic dockyard is Portsmouth Harbour. If you are interested in visiting a lot of the attractions at the harbor, you might want to check out this discount pass that includes entry into 11 different sites at the dockyard. 4. Now, you might want to see if you think you have enough time to do both Portsmouth and Stonehenge in one day or if you’d rather do them on separate trips. It will depend on how long you want to explore Portsmouth. You can squeeze them both into one day but it will be a busy day. So you could leave Portsmouth in the afternoon by train and head to Salisbury (closest train station) and then take the Stonehenge Tour bus which stops at the train station (as well as in Salisbury, Old Sarum & Stonehenge). Then in the evening could take a train back from Salisbury to London. Note that Stonehenge has recently implemented a timed entry system so it is recommended that you book your tickets in advance. 5. If you decide to do Stonehenge on a separate day from Portsmouth, you have a few options, you could take the train from London to Salisbury and get the shuttle as noted above, take the Stonehenge Express bus from London, or you could join a guided bus tour. There are a lot of tours from London to Stonehenge and most also makes stops in other places like Salisbury Cathedral, Bath, Windsor, and/or Oxford. You can see some examples of these tours here and here. Hope this helps and please let me know if you have further questions as you plan your trip to the UK! Great informative article, thank you!! Hubby and I will be travelling to London for the first time later this year aa part of our uk trip and plan to purchase the oyster card when we arrive at heathrow airport. As you have suggested I will register the cards using my relatives uk address. I have a few questions please. We will be arriving at heathrow airport around 6am. Will there be an oyster card cashier open at that time of the morning? If not how do we purchase one at heathrow airport, register and top up? We will be landing in terminal 2 as far as i know. Do you know if there is an oyster cashier or ability to purchase at this terminal. We will most likely be very sleep deprived from travelling from australia so as much info would be greatly appreciated. Hi Sarah, Glad you have found our Oyster Card tips helpful for your trip! The Heathrow Visitor Centers and manned ticket windows at the Heathrow Underground stations may not be open that early, but you can purchase the Oyster Cards (standard ones) at most Underground ticket machines. Heathrow currently has three London Underground stations – one for Terminals 2 and 3 and one each at both Terminal 4 and Terminal 5. To register a card, you need to set up an online account and then register the specific cards online. You’ll buy the card with some credit so you don’t need to top up right away. You can top up as needed via ticket machines, manned Underground windows, or online (if you are able to register the cards). If you want to have a Oyster Card in hand when you arrive, you might want to consider a Visitor Oyster Card instead as those can be mailed to you in Australia before your trip. However, these cannot be registered if that is important to you. Hope this helps, and wishing you a great visit to London! I really appreciate this guide to Oyster Cards, the most comprehensive one around! Comes in really handy for my upcoming trip to London this April! It would be real helpful if someone could help clarify: Visitor OysterCard vs Regular OysterCard. 1)Other than the non-refundable fee $5(Visitor OysterCard) and refundable fee $5(Regular OysterCard), is there any difference in the fare charges when using Visitor or Regular OysterCard? For instance, as stated in the write-up, traveling from Zone 1 to Zone 2 on the tube will cost £2.40 off-peak using a Visitor Oyster card. For the Regular OysterCard, will it cost the same (£2.40) or will it be charged as single ticket rate (£4.90)? 2)I understand that the Visitor OysterCard comes with a daily cap eg. $6.60. Does the same daily cap apply to Regular OysterCard? Or there is no cap for it? Looking forward to hearing from the Experts! So glad your found our articles about the Oyster Card and London travel helpful! 1. ) No the fare charges are the same for them both. Basically the usage for both is the same across the two Oyster Cards. 2.) The daily caps are the same for both the regular and the Visitor Oyster Card. The big differences other than the refund-ability of the fees is that the Visitor Oyster Card (but not the regular card) can be pre-ordered and delivered worldwide before your trip and the Visitor Oyster Card has extra discounts on attractions/food/shops. Whereas the Regular Oyster Card (but not the Visitor Card) can be registered online if you live in the UK and you can add Travelcards to it (although you wouldn’t likely do this unless you are staying in London for 7+ days). Hope this helps, and just let us know if you have further questions! Thank you Jessica for the prompt response. It has been a great help to the planning of my trip to London! Wonderful information! But still a little confused..lol..We are visiting London in May for 7 nights and arriving at Heathrow and staying near Earl’s Court. I understand I can buy an Oyster card at Heathrow and use it on the Tube to our accommodations near Earl’s Court. I just am not sure which to buy..as the Zone thing still has me a little confused.If we purchase an Oyster card (at the airport) and add the 7 day Travel Card to it,I understand that only covers Zone 1 & 2. And the airport is in Zone 6. Would we have to purchase something additional that covers Zone 6?. I am quite positive we will just have the 2 trips in this zone.I hope this inquiry makes sense..:)..Thanks in advance for any advice! Hi Lisa, Yes, so what you said does make sense. And you can indeed buy an Oyster Card (the standard one, not the Visitor one) at Heathrow airport and can also add on a 7-day Travel Card for Zones 1 & 2 at a ticket machine. But you can still use the Oyster Card anywhere it is valid as long as you have additional credit on it, but the Travelcard portion is only applicable to travel within Zones 1 & 2 as it provides unlimited travel in those zones. I would not buy a Travelcard that covers additional zones if you are only planning to visit them once or twice as the price jump is pretty significant and almost all the main tourist attractions in London are in Zones 1 & 2. If you are traveling outside of Zones 1 or 2, you’ll need to have additional credit on the Oyster Card to cover that travel or you can of course just buy a ticket separately.. Note that the above only applies to the standard Oyster Card, not the Visitor Oyster Card which comes with pre-loaded credit and does not allow you to add Travelcards. Both cards work in all zones throughout London. To determine if the Travelcard is a good deal, I would estimate how often you plan to travel to see if it makes sense to get the Travel Card or not. It really depends on how many journeys you plan to make each day using public transit. If you plan to use it multiple times a day, then the Travel Card makes sense, if only a couple times a day you are probably better off without the Travelcard on the Oyster Card. Hope that helps! 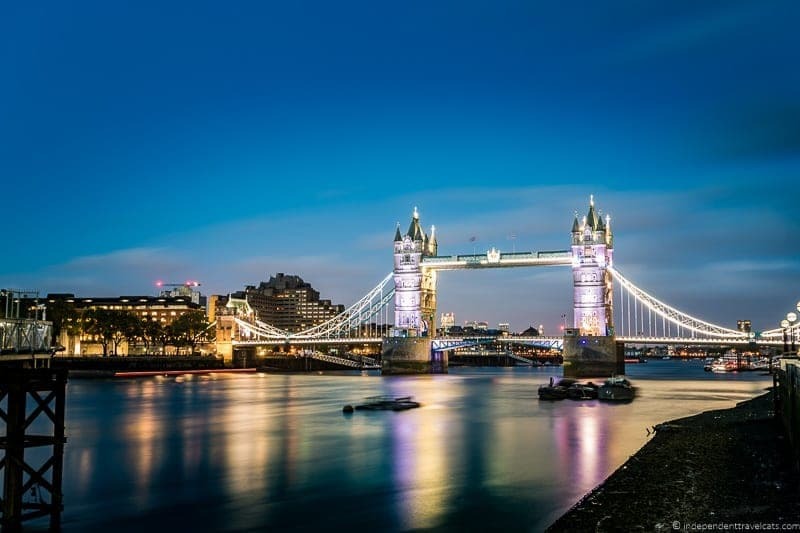 Wishing you a great trip to London, and if you are looking for sightseeing ideas, you might find our 6 day London itinerary helpful. All my questions were answered and now, unfortunately being too late to get a visitor oyster online, the only issue left is if I can buy two “normal oysters” plus a “kid 15 years old oyster” as well somewhere at Kensington station around 6 pm on a Monday… or if we should try to take care of that at Luton airport right after arrival around 11 am next Monday. What do you suggest? Thanks so much for your kind words and I am glad you found our information on Oyster Cards helpful and useful! I think either should be fine as the travel centre will be open at Luton and if that is convenient for you, it can be an easy place to purchase the Oyster Cards. You can’t use the Oyster Card though until you reach London as Luton is a little outside the travel area, but you can start using them once you arrive in London. But you can also get them at Kensington train station and you can purchase them from a machine or from an attendant if you need any help. I think there is a ticket window at the station that is staffed until around 8pm on weekdays. But if not, there will be staff in the station to help with any info until very late if you have any issues with the machines. BTW, You can still get a Visitor Oyster Card if you are also planning to buy a London Pass, if you order the London Pass + Transport option. For adults, the London Pass comes with a pre-loaded Visitor Oyster Card (children’s passes come with a receive a paper off-peak Travelcard). If you order online and choose the “pick up in London option”, you can pick up both your London Pass and Visitor Oyster Cards at their redemption desk in central London. Wishing you a great trip to London! OMG!!! Am so happy and thankful I found your website while searching for info on oyster card. Thank you for taking time to explain extensively the pros and cons. Your info and tips are so helpful. and so simply put; very easy to understand. We’ll be in London on Feb 15, – 20, 2018.; we’re with a 7 days London and Edinburgh tour but we’ll arrive London 2 days ahead and will be on our own.. I will read more of your website to read your suggestions on places to see while in London during the 2 days before the tour and the “free time” during the tour.. Thank you for unselfishly sharing your knowledge. Take care, more power to you and Laurence. Thank you for all the great tips and posts about the Oyster Card and getting around London! I am trying to apply for an Oyster Photo ID card for my 13 and 16 yo before our March 2018 trip to London. States that it takes 4 weeks. When try to complete “Create an account” on Oyster website, it does not allow US zip code. Also, any recommendations on where to stay if we want to use the most out of our London pass (also many thanks for your itinerary recommendations using a London Pass!) Appreciate any advice you have, thanks! You can’t get them shipped to your home as an overseas person so you will need to pick them up. Also you can’t register an overseas regular Oyster Card (although you can purchase a standard Oyster Card once in London) as an overseas visitor. But you should be able to order and process your children’s Zip cards online and track them. Let me know if you are able to get it to work. If it is still now allowing you to create the account, I would give them a call or email them for assistance because you should be able to do so. Now if you are not able to do the above for any reason, you can get a Young Visitor discount applied to a normal Oyster card once in London. And yes, I would check the centre hours with regards to your flight arrival time, but you should be able to pick up the Oyster Cards at Heathrow Airport at one of the two Visitor Centres (I know you can’t get these discounts at Gatwick according to the website, but should at Heathrow). If you’ve already read our suggested 6-day London itinerary, you can see we recommend a lot of different neighborhoods in London. Since you’ll have Oyster Cards, anything within a 30 to 35 minute commute by public transit to Westminster is a really central and great spot in London for this itinerary. Of course the further away, the better the prices may be. I would first start looking and finding hotels and accommodation that fit your budget and style. Then narrow down by checking locations from the central area (for example use Westminster Abbey as the point of reference) using Google maps and see if you can find something within a 35 minute public transit commute. Note that the London Pass will be increasing in price soon so I’d recommend ordering them now online to get the current prices. There is also a current holiday sale online (up to 20% off) until the 27th! Hope this helps and let me know if you are able to get the child Zip Photocards ordered online through the TfL website. I tried your link and it worked! Better than through website itself. However, when I tried to apply for my 16 yo though, the fee was 20 pounds! Seems quite unreasonable, so I wouldn’t recommend for your travellers. Thanks for the other additional information in your reply. Your information has been invaluable. So grateful for your quick reply. You’re very welcome and so glad it worked! Um, yes, sounds like the fee is not worth it for a short trip. Probably a better solution for those staying in London for a few weeks or longer to get their money worth. Was the fee the same for both of your children? Happy to help and wishing you a wonderful trip to London! Hi Jessica, Thanks for the amazing information ypu have shared on this website regarding the oyster card and other travel cards. I am planning a trip to London from Asia this December with two 4 yr olds. I would be grateful if you could detail me which card I should use to explore London city attractions and parks. Do we need to get a London pass as well or just the oyster card? 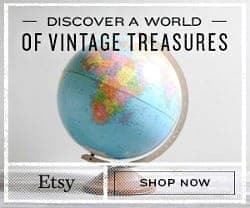 Do I need to purchase it online before the trip? We will be there for 2 weeks. Please suggest an itinerary for our 2 week stay in London. We plan to stay at Wembley. Thank you for these great informative posts. Hi Nat, Glad that our posts about the Oyster Card and London Pass have been helpful. Now, for your children, since they are 4 years old, they will travel for free on public transit within London with you so they do not need a pass as long as they are traveling with an adult with an= valid Oyster Card. For adults, regarding public transit, you can purchase an Oyster Card in advance online or get one once you get to London. You also have the option to purchase it as part of the London Pass package. All these options are described in the article above with links to where it can be purchased. Now, the Oyster Card is only for travel on public transit within London, it does not get you into any museums or attractions. For that you can purchase a London Pass. You can purchase the London Pass online in advance and have it delivered to your home before your trip and it is valid for 1 year. Or there is one place you can purchase it in-person once in London. 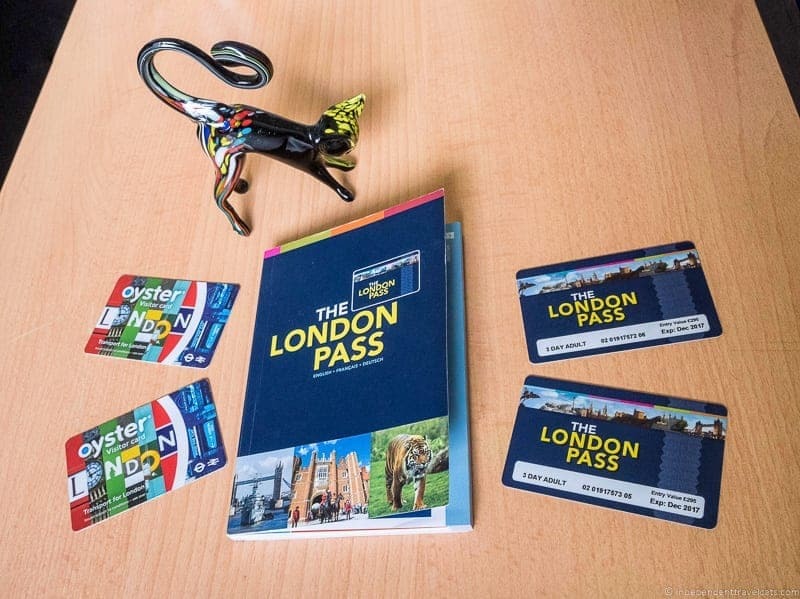 The London Pass can be purchased just as an attractions pass, or you can also add on the Travel Option to it so that it also come with an Oyster Card. If you are planning to get both the London Pass and the Oyster Card, then it is probably most convenient to just order the London Pass + Travel package for you and any adults traveling with you. The kids, since they are only 4, again will get into most London attractions for free so they do not need a London Pass or Oyster Card. Hope this helps & happy travels to London! That is awesome Jessica. You just made it so simple for us. I spent days looking at various websites which confused me more and more. Now I know I just have to get London pass with travel card and I will choose either Smartmobile option or pick up at London. Thank you for your excellent suggestions on how to tour in London. I will consider that for sure. okay..point well noted Jessica. Thanks! Excellent job! Before I read your article, I read through various online articles (some clearly outdated) and became increasingly confused. 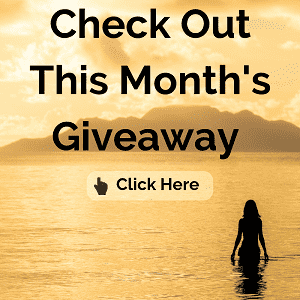 Upon reading yours, I have a much better understanding of the various options (still a bit challenged on the “best” way we can leverage the various options given our travel plans – but at least I understand the options). One question that I’m not clear on – when the discounts are calculated does it combine all types of eligible travel types/modes to determine the caps? Or for example are the caps determined by each transportation mode, i.e., are Bus trips a separate calculation from Underground trips, and separate from Light Rail trips, etc.? Hi Jessica, how wonderful to find you! I have read all your info and the comments from others all very helpful. We will be in London in January for 7 days ( 2 couples from Australia) we arrive in London from Edinburgh by train and staying in Clapham. We will be sightseeing in London ( a friend who lives in London will be showing us around) but plan one day to visit friends near Reading . We will be flying home from Heathrow. I am thinking from your information that a regular Oyster card would be our best option.? Can we buy the Oyster Card in Edinburgh ? Will we be able to use it to travel to Reading? What is best option to get to Heathrow? You suggested buying tickets online? What is difference in cost for Edinburgh to London? Glad that our information on the Oyster Card and public transportation in London has been helpful. I will try to do my best to answer your questions. 1. You can’t physically buy the Oyster Card in Edinburgh as it is only sold in London. For online orders, it is only shipped to UK addresses. You might be able to order the standard Oyster Card and have it delivered to an address in Edinburgh and pick it up. However, it would probably be easier to just pick it up in person once in London at a vending machine or ticket office (you can buy it at most Underground, National Rail stations, Oyster ticket shops, visitor centers etc.). Alternatively, the Visitor Oyster Card, you can purchase it online and have it shipped anywhere including Australia (although you can’t buy it once you are in London). 2. No, unfortunately, the Oyster Card can only be used within London (Zones 1 to 9) so you will need to purchase a regular rail ticket to travel from London to Reading and back. 3. It depends where you traveling from in London that day, but the fastest way is generally the Heathrow Express and the cheapest way is the Underground. If you are trying to save money, I’d take the Underground to Heathrow and you can use your Oyster Card. The Oyster Card is not currently valid on the Heathrow Express. 4. For train tickets you can generally save money by booking train tickets in the UK in advance. The price differences can vary but generally lower fares are posted about 3 months or so in advance and tend to get more expensive the closer to the time, although there are of course exceptions. Hope this helps, and wishing you and your travel partners, a great trip to Edinburgh and London! I am travelling to London from Kent in October with my 12 year old daughter. We arrive Friday evening and Leave Sunday afternoon. My head is spinning with travel options – last time I went to London I just gave 30 pence to the bus driver. If I tell you what I plan to do perhaps you can tell me (in words of one syllable) if it is viable/sensible? 3. Go to ticket office when we get to London Bridge and have staff put child discount on 1 oyster card for my daughter. 4. I know I can use my debit card but I would rather be waving around my oyster card in public than my debit card! Yes, traveling in London can be confusing as there are so many options and so many types of public transit. A good and bad thing! I think getting an Oyster Card is a good choice for you and I think your plan sounds like it would work fine. The only things I would add is that 1.) check out whether a Zip Oyster Card or just applying a child discount to a regular Oyster Card would be a better value for your daughter, and 2.) I would be sure to register both of your Oyster Cards online once you receive them in the mail to better protect them in case they are lost, stolen, or damaged. 1. Yes, buying train tickets in advance can definitely save you money in the UK! 2. Yes, I’d get a regular Oyster Card for you (not a Visitor one since it sounds like you live in the UK) and then you can top them off as needed at the Underground stations if you use more than the £20. For your daughter, I’d check the difference online between applying for the Zip Oyster photocard versus the Young Visitor discount applied to a normal Oyster card. As she is 12, a Zip Oyster Card (she could use until age 16) would give her free travel on any bus or tram in London plus child rate on most other forms of transit (Tube, DLR, London Overground, TfL Rail, Emirates Air Line and most National Rail services in London). 3. Yes, that is a good plan if you want to apply a child discount to a normal Oyster Card. If you get a Zip Oyster card, it should work just like the regular Oyster Cards and you should be able to top them off in self-service Tube machines, at ticket windows, or online. 4. Yes, definitely can be safer. I’d register your Oyster Cards online once you have them to better protect them if lost or stolen and then you can also track your credit, top them off, and get other information online from your account. Hope this helps, and wishing you a fun and safe trip to London! This information is so awesome! Thank you so much. Next month, my husband and I are traveling to London, then to Southhampton for a cruise. We will stay in Paddington for 2 days, then 1 night in Southhampton before the cruise. Since Southhampton isn’t in the city of London, would we be able to travel from Paddington to Waterloo with the Oyster card, then take a train to Southhampton that I heard about? Not sure how that works. Thanks so much. Any tips on what train we should select in Waterloo for our trip to Southampton? I will definitely check out the two day London itinerary. Anything fun to do in Southampton? Is it cheaper for me to load a 1 month travel card into my Oyster card as I will be staying in London for almost 7 weeks? Most travels will be in zones 1 and 2 with a few days to zone 4. The best-written description and advice I have found so far about Oyster cards. 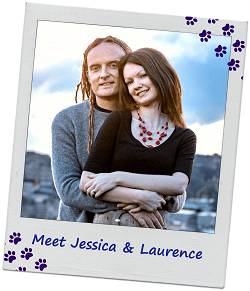 Thanks a lot, Jessica and Laurence, is really useful. I am taking a trip to London with my wife for 5 days in September in two parts. Oyster card seems a very good option. Not sure about London pass as I have read opposing views on the pass.I will explore this site further for other parts of Europe too. The short answer is that it depends but you are probably not able to add credit online unless you have a UK address. If you have a Visitor Oyster Card, then there is no way to top them up online. However, if you have a standard Oyster Card then you can register them online and top them up when logged into your account; however, I believe you need to have a UK address to be able to have an online account. If you have a UK address, you can find out more about that here. If you are not living in the UK (or purchased a Visitor Oyster Card), it is easy to top up your Oyster Card at any of the Underground stations through the machines. This is what I would recommend doing as it is very easy to do it at the machines and probably quicker than registering and topping up online if you don’t live in London or visit that often. Hi. You cover an enormous amount here on London Oyster cards but there is one more little thing please. I have a visitor Oyster card from a previous trip. Now my wife and I are heading to London for 4 days. Can we both operate off the one card or does my wife need her own. Obviously if we use just one we will need to top it up with more credit than if just I use it. It would mean we don’t need to get a standard Oyster card on arrival and not pay 5 pound ( even though it is refundable – just less hassle using just one ). Hi there! Great article but I’m still confused as to which one will be best. We have two adults, one 17 and one fifteen year old. We will be traveling to London from Edinburgh on a train. We will have a half day after the train, and 4 full days of site seeing and leaving Sunday morning from Gatwick (so to be able to get to Gatwick would be helpful). I’d like to be able to ride during the busy times so we can get to the sites early. I’ll probably buy us all a 6 day London Pass as well. Do I need a Visitor or Standard Oyster card? Do I need a Travel card for a trip of that duration since I’m not there a full week? What are your recommendations? The differences between the two Oyster Cards can be confusing. Since you are in the city for less than 7 days and won’t need to use the travelcards, there is not a whole lot of difference between the two types of Oyster cards for adults. If you are already buying the London Passes, I’d just purchase the London Passes + Travel for the adults. However, for the kids, since they are over 11, they are not eligible for free travel on your cards, but as noted in the post, you can apply to get them special IDs (Zip Oyster photocards) so they receive free and discounted travel in London. You do need to apply for this ahead of time (4 weeks or more in advance if based outside UK). I would recommend doing that if you can. However, if you do not/cannot apply for the Zip Oyster photocards, you can choose to just get them a regular Visitor Oyster Card (would come with the London Pass for your 17 year old), use the off-peak child travelcard (it also comes with the London Pass for 11-15 year olds, but does have some time restrictions), or purchase child tickets as you go. The first will save you time as you just tap it and go (and refill as needed), the second one gives you the child rates but is restricted during peak hours (if you are traveling during morning rush hour you may need to purchase a separate ticket), or you can just pay for tickets as you go (may save you money vs. the Oyster card, but takes more time). There is currently no regular Oyster Card for kids. The Oyster cards can be used to get to Gatwick (underground and National Rail) from central London (e.g., Kings Cross, Victoria Station) and it is pay as you go so I’d advise traveling during off-peak hours if you can to save money. The cards can also be used on the Gatwick Express train to the airport; however, it costs £19.80 for a single journey. Since you are coming from Edinburgh, it is easy for you to either pick the passes up in London on arrival or you can have them mailed to you beforehand (if you were flying in it is often better to have them beforehand so you can use them to get into the city). Great tips! There is one thing that would need to be updated on your article. Fares with the Oyster Card have been changed since you published this, the daily fee is now £6.60, while a 7-day pass costs £33. Great info! We will be traveling with two 10 year olds for a week in April. Would it be worth it to preorder the child oyster card (zipOyster I believe it’s called)? We will mostly remain in London, but we will need to take the train in from Gatwick and are planning a day out to the Harry Potter studios. I’m wondering if it would be worth the 20 pounds to be able to tap in and out rather then have an attendant let them through. Thanks for any help! Glad you found our London Oyster card post helpful; it can be a bit tricky! Note that you can take the Underground (Tube) to Watford Junction station with the Oyster Card to connect to the Warner Brothers Studio Harry Potter Studio tour shuttle without needing to buy any tickets. Great advice on how to use the Oyster Card. Often these public transport cards have so many rules and regulations it just becomes too hard for the traveller. Thanks for all this info! I seem to collect Oyster Cards… we bring them home after each trip from England but don’t always remember to pack them in the suitcases when returning. Because we are a family of five I am inevitably buying one or two more each trip for the kids. I have a fortune in UK pounds sitting in my top drawer on all our Oyster Cards… LOL !! Thanks for the tip regarding the contactless card didn’t know that. Will check out Laurence’s post. Thanks again for the tip! I don’t think the Oyster Card existed when I was in London. It’s the first time I hear about it, but it seems like a very convenient way to use London’s public transportation. Great information!